The moon will not be visible in the night sky, because it will be situated on the same side of the Earth as the Sun—specifically in the constellation of Capricorn (The Goat). 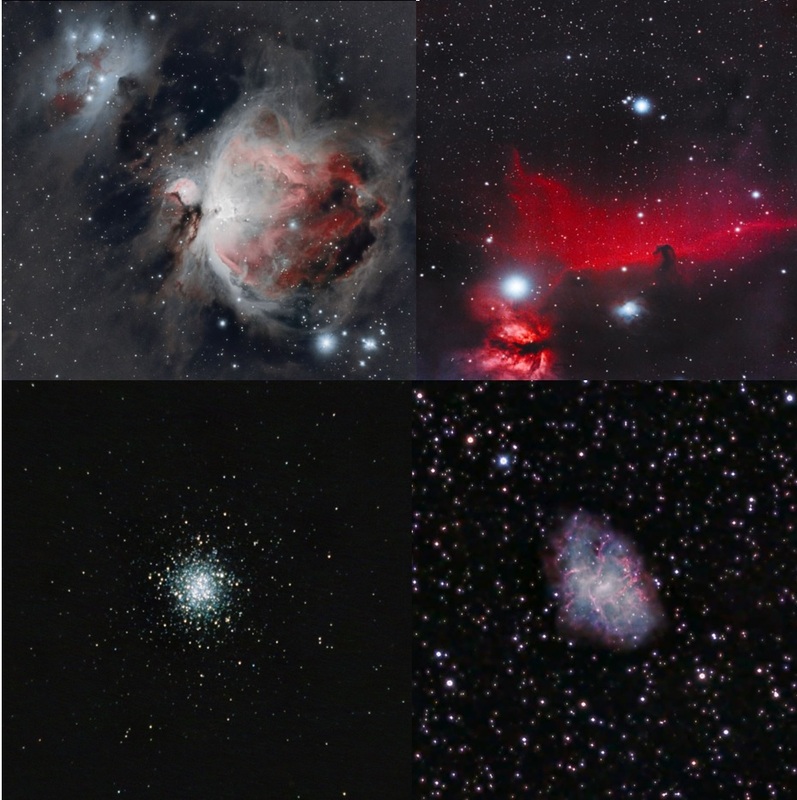 This is the best time to observe deep-sky objects, such as the Orion Nebula, Horsehead and Flame Nebula, as well as the Pleiades and fainter ones like the Crab Nebula and globular cluster Messier 53. The month transition from Djumada l-Ula to Djumada l-Akhira shall take place two days later (February 7) in accordance with the Hijri Calendar 1440. The waxing crescent Moon—about 23% illuminated—will be at 6°04’ southwest of the red planet Mars in the early hours of the evening, with the pair appearing at the southwestern part of the horizon right after sunset at around 6:30 P.M.Situated in the faint constellation Pisces (The Fishes), the Moon and planet Mars will both set at around 10:45 PM. The Moon-Mars Close Approach on February 10 (not to scale), as shown in this image screen grabbed from planetarium software Stellarium. 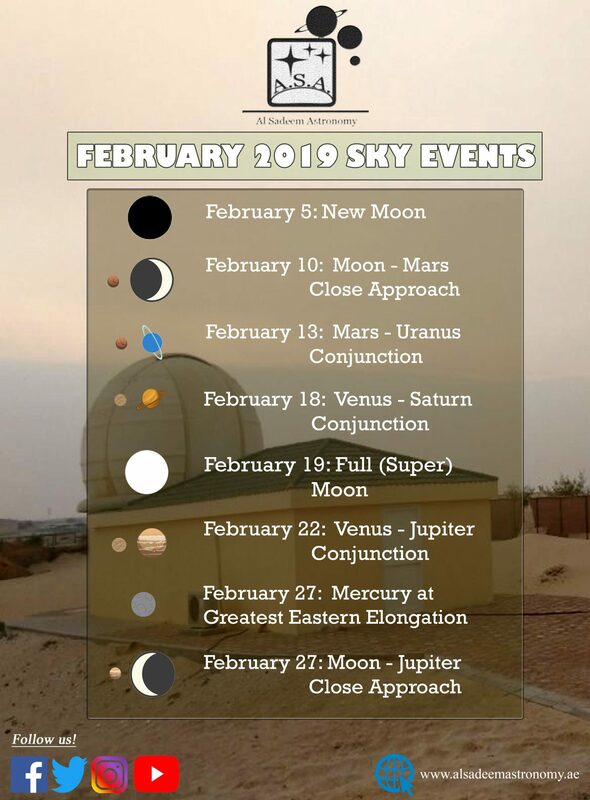 The red planet Mars and the faint bluish planet Uranus will appear close to each other in the early evening hours of this day, particularly right after sunset until 10:45 PM. The planet pair will be separated 1°03’ from each other, and will be both spotted in the constellation of Aries (The Ram). Capturing the conjunction requires long-exposure photography, preferably with a long camera zoom (preferably 100-400 mm) lens. 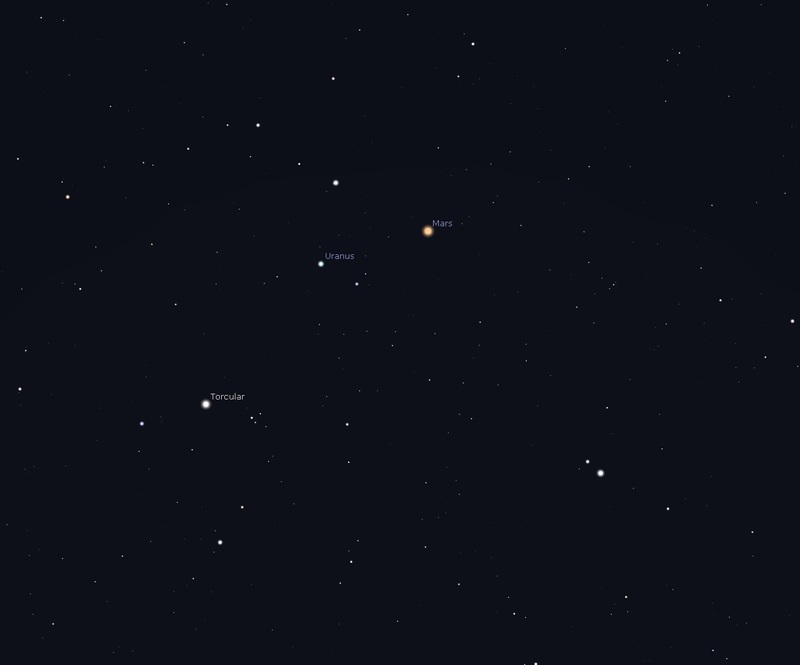 Mars-Uranus Conjunction on February 14 (8.12 ֯ FOV), as shown in this image screen grabbed from planetarium software Stellarium. 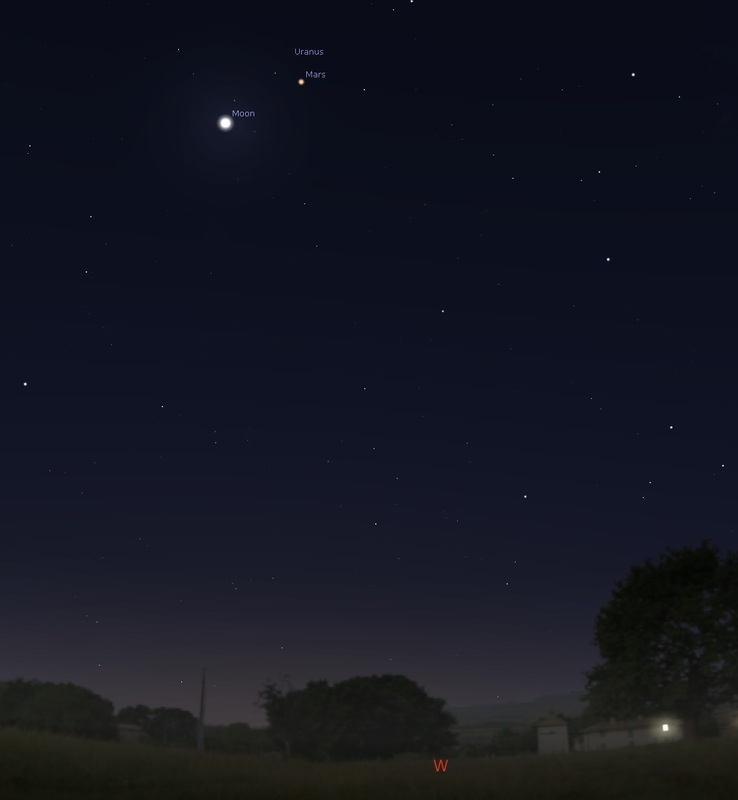 The two bright planets Venus and Saturn will appear close to each other at dawn on this day. The two planets will be 1°05’ apart in the constellation of Sagittarius (The Archer), which will be seen at the southeastern portion of the sky from 4:45 AM until sunrise. Venus is the brighter object situated a degree northwest of Saturn. Also seen to the far northeast of the pair is the gas giant Jupiter. 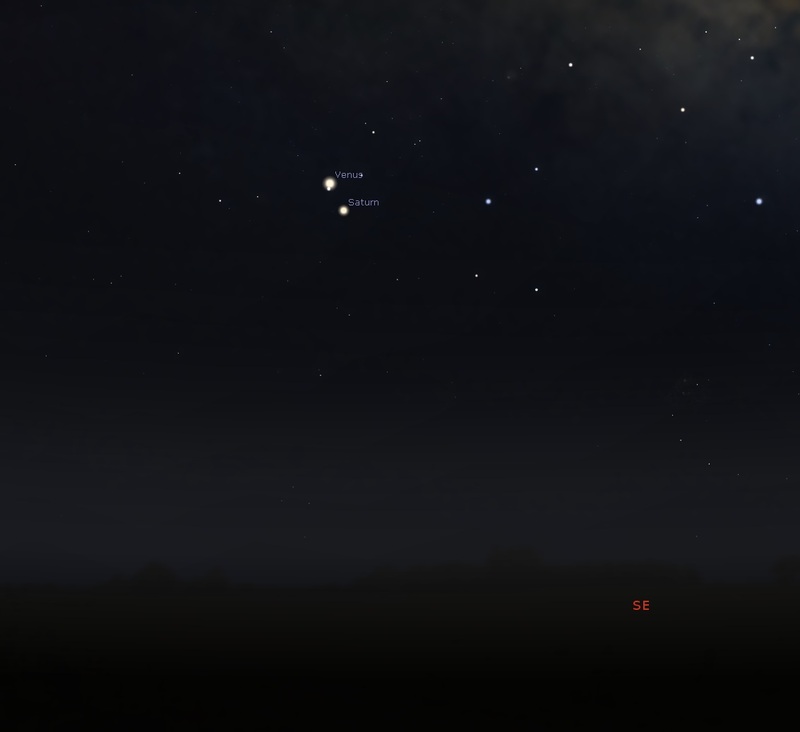 Venus-Saturn Conjunction on February 18 (not to scale), as shown in this image screen grabbed from planetarium software Stellarium. There’s a hundred percent illumination of the moon, and selenophiles—or those people who have a strong penchant for the moon—will be in for a treat as this is the best time to observe all the surface features of the Earth’s natural satellite, including its craters and lunar maria, or the large, dark, basaltic plains on Earth’s Moon.As early as 6:20 P.M., the Moon will show itself at the east-northeastern horizon in the constellation of Leo (The Lion). 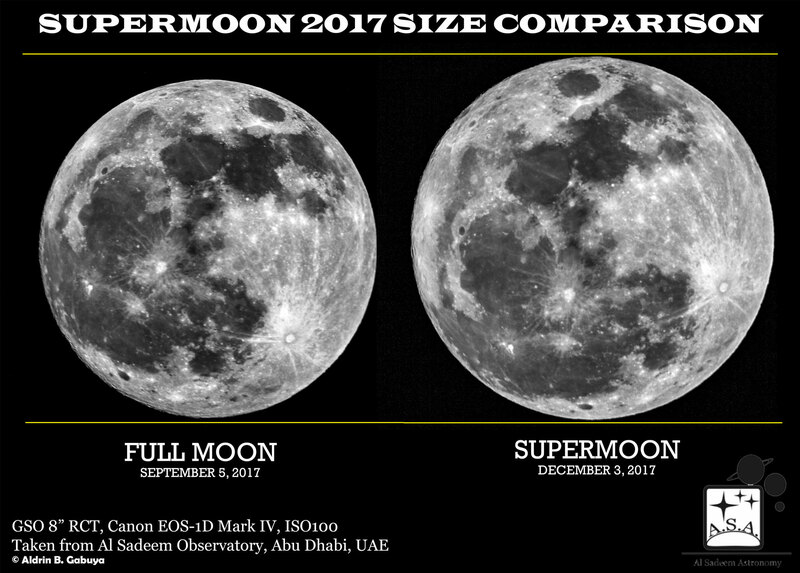 A comparison of ordinary full Moon with a Supermoon, or a full Moon at perigee. The Moon will also be at its perigee—or its distance closest to the Earth, making it appear approximately 7 percent bigger and 16 percent brighter than the usual full Moon. This is the second in the “Supermoon Trilogy,” or the three consecutive occurrences of Supermoons for 2019. Mercury, the smallest and closest planet from the Sun, will be at its highest point in the sky, beginning at sunset (around 6:35 PM) until disappearing from view as it sets at around 7:10 PM.Because of its close proximity to the Sun, it would be a challenge to observe the planet with its maximum extent of angular separation from the Sun—as seen from Earth— 11° above the western horizon in the UAE sky. 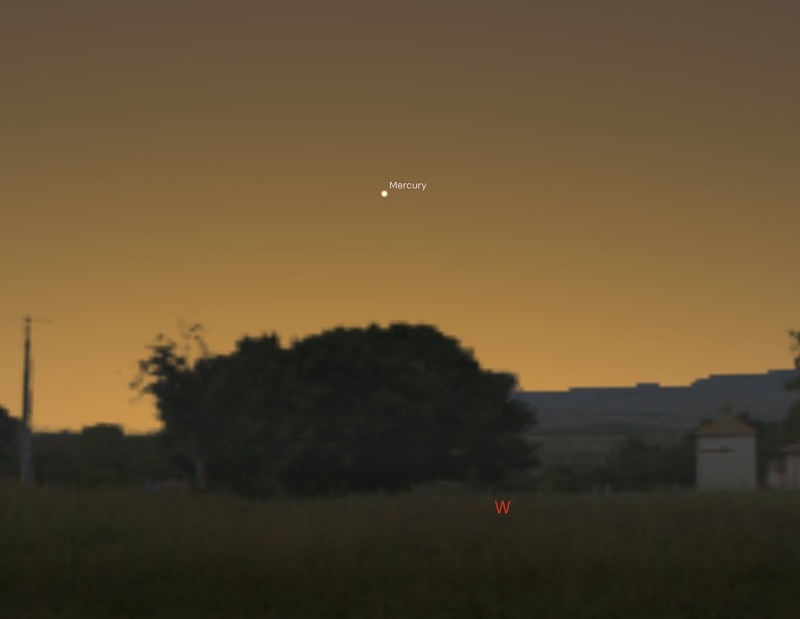 Mercury at Greatest Western Elongation (about 11° above the eastern horizon) right after sunset on February 27 (not to scale), as shown in this image screen grabbed from planetarium software Stellarium. 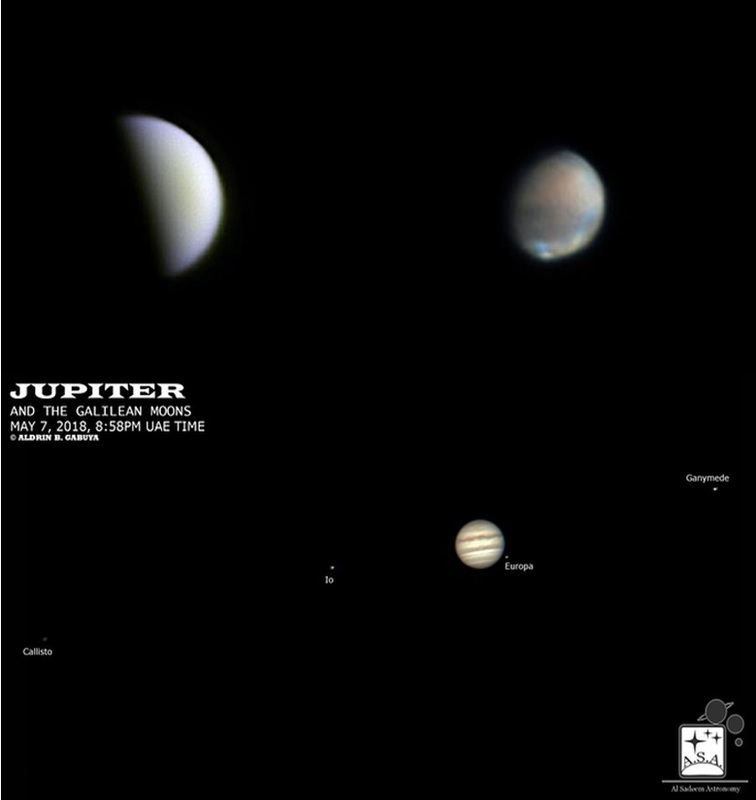 The moon and planet Jupiter will appear close to each other (around 2°19’ angular separation) at the sky when viewed from Earth. This close approach will be visible at eastern portion of the sky in the constellation of Ophiuchus (The Serpent Bearer) from around 5 AM until sunrise. The moon will be at the Waning Crescent phase (about 8% illuminated). Jupiter would appear as a brilliant white “star” northwest of the Moon. An estimated proximity of the waning crescent moon and Jupiter at 5:30A.M. 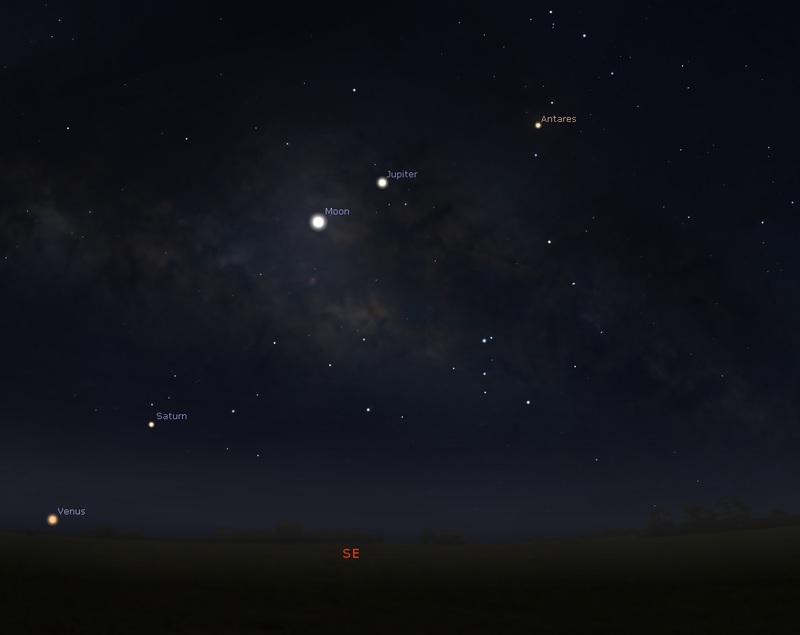 on February 27.Image screen grabbed from planetarium software Stellarium.